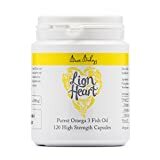 Lion Heart capsules contain the same incredible fish oil as their big sister Lion Heart liquid, with super high levels of EPA & DHA and no heavy metals or other nasties. They’re made with fish gelatin and nothing else added. We think it’s just wrong to put fish oil in a beef or pork gelatin capsule, and you don’t need to add flavour because you don’t taste them. Simple & unadulterated fish oil. We recommended a daily dose of 4 x 500mg capsules containing 1,460mg Omega 3 with 860mg EPA & 440mg DHA, an excellent daily maintenance amount equivalent to a whole tin of sardines. One tiny capsule contains 3 times more EPA & DHA than a leading brand 1,000mg capsule (the big ones you can’t swallow!). Perfect for taking on your travels, keeping in your desk or for those that don’t want a liquid. They’re very small so they’re easy to take, in the natural triglyceride form for easy digestion and maximum absorption, and guaranteed to never repeat on you because they’re super fresh (oxidized fish oil repeats on you, not pleasant).